We are proud to announce that our Chinese joint-venture Star SU International Trading (Shanghai) Co. Ltd won the “2018 Annual Users Good Choice Award” of “AI Automobile Manufacturing Industry” thanks to its Scudding tools features. 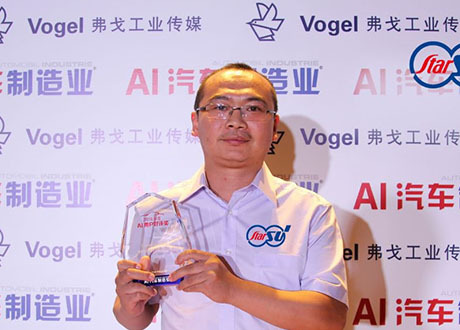 Indeed, on June 27, 2018, Star SU China was invited to take part in the exciting award ceremony of the “5th AI Users Favorable Comment Award “, which was held by the trade magazine of “AUTOMOBIL INDUSTRIE China ” under the German Vogel Industrial Media. Mr. Han Jinxin, Cutting Tools Sales Manager of North of China of Star SU China, proudly received the award on behalf of Star SU China. The selection of “AI Users Favorable Comment Award” had lasted for 3 months. Through the comprehensive network voting user evaluation, editorial evaluation, users telephone survey and other links, “AUTOMOBIL INDUSTRIE China” finally picked out the automobile equipment products and solutions featured with “advanced, practical, reliable, high quality, high efficiency, intelligence and cost performance”. Thus, Star SU China’s Scudding with 3757 votes, won the ” 5th AI Users Favorable Comment Award” prize. The awarded Scudding ® tools are the result of an alliance between Profilator, Star-SU and our Samputensili company for the global market. Their manufacturing technology allows the machining of internal or external gears/splines without the need of an undercut or groove. The end of the gear can be a defined programmed ramp of radius. This process is quicker and more productive. In fact, the high number of cuts per time unit not only leads to a very short cycle time, but it also produces high quality gears with a low surface roughness. Nowadays, Chinese automobile market has higher requirements for the manufacturing efficiency, quality and cost. In this regard, we are glad to claim that our joint-venture can provide customers leading solutions to meet all their production needs. Born on March 1, 2015, Star SU International Trading (Shanghai) Co. Ltd is a key result of the fruitful partnership between Samputensili and Star Cutter in order to strengthen and extend their presence on the global market and in particular to the Chinese market. Actually, the expansion of the co-operation to China enhances the presence of both Samputensili and Star Cutter in this strategic market, strengthens their position and allows them to achieve a competitive advantage in this country. We congratulate on our Chinese joint-venture for this trophy and we also would like to thank all customers and friends who voted for them. Customer satisfaction is always the most powerful engine to push Star SU China and our Samputensili Company moving forward!